I would like to congratulate immediate past president Arte Torigian on his successful tenure as president of this chapter. During the past year under his leadership our chapter was able to provide five quality training seminars, grow our membership, and guide us towards our future with a new logo, new website, as well as a continued partnership with the Red Jacket Beach Resort for our June seminar. I would also like to congratulate Barry Gannon Sr and Richard Taylor for their re-election to the board of directors, as well as the election of Michael Mazza back to the board of directors. Mike is one of the most well known faces of our chapter and I am happy to see you back on the board. I truly look forward to working with our current officers and board of directors to serve our membership for the year to come. One change we can already look forward to is a new September seminar venue. For the past several years we have gathered at the Maynard Rod &amp; Gun Club. This year I am happy to say we will be returning to the northeastern part of the state. Our September seminar will be held at the Lawrence Firefighters Relief’s Inn located on Market Street in Lawrence. Please join us and stay up to day on the goings on of our chapter through our web site www.maiaai.com and follow us on facebook. If you have any suggestions or ideas of items you would like to see on either source please reach out to us. Topics such as legal updates, fire investigation updates, or just articles on current fire investigations going on throughout the Commonwealth or beyond. The fire investigation field is constantly changing both technically and legally. We as a team will work tirelessly for this membership to continue providing quality relevant training to both our public and private sector members. If any member or visitor to this site has suggestions on possible training topics or on any issues you are currently dealing with and would like to see addressed by the chapter please reach out to any one of us. As fire investigators we work in a small community. I hope all of you see the rich benefit of belonging to this chapter. Not only to receive quality training, but as a means to speak with other investigators, and talk about current trends in our field whether positive or negative. One goal as investigators should be to stay educated and current on all topics of fire investigation. I believe we at the Massachusetts Chapter are able to accomplish this on a regular basis. 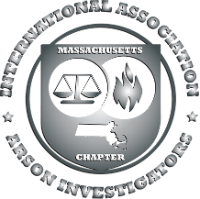 I encourage you to invite other investigators or friends of the fire investigation community to come to a seminar and consider joining our organization.